Home is a cozy word. It's where the ruby slippers take you. It is where the heart is. More complex ideas come up in the exhibition at LACMA: Home — So Different, So Appealing: Art from the Americas since 1957. 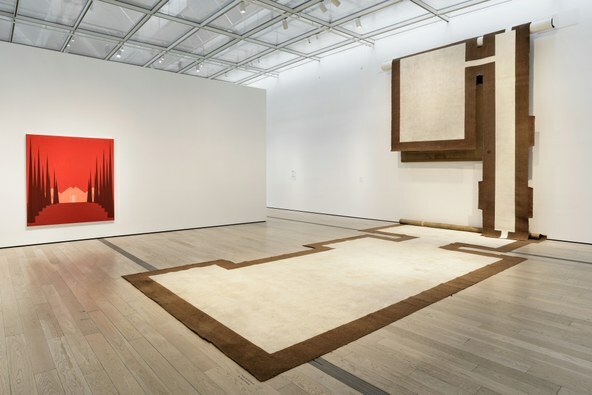 It offers us the first view of LA/LA, (Los Angeles/Latin America), an expansive program that includes dozens of exhibition at museums and other institutions as well as commercial galleries over the course of the next six months. Funded in part by the Getty as their second iteration of Pacific Standard Time, this exhibition suggests that the initiative is off to an extremely promising start. Whether an artist in East LA or Buenos Aires, the show suggests that the very idea of home is fraught with the tensions of today and great geo-political shifts of the past three decades. Exhibitions of this sort can veer into the realm of hectoring tirade with the artworks chosen as illustrations. Thankfully, that is not the case with this exhibition. 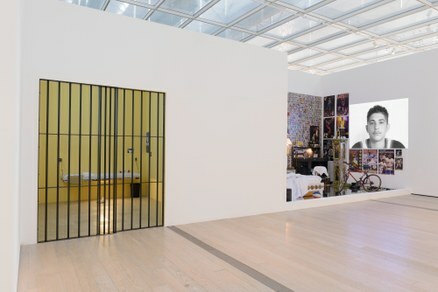 The works were astutely selected by three co-curators: Chon Noriega, a highly respected leader of Chicano studies here and adjunct curator at LACMA; Pilar Tompkins Rivas, director of the Vincent Price Art Museum; and Mari Carmen Ramírez, curator at the Museum of Fine Arts Houston, where the show will travel. With some 100 works by 40 Latino and Latin American artists exploring the theme of home, it is a sprawling affair but far from arbitrary. Concepts are explored in a network of thematic interrelationships and some pieces of have exceptional potency. The title of the show is derived from British Pop artist Richard Hamilton's 1956 collage with the text, "Just what is it that makes today's homes so different, so appealing?" 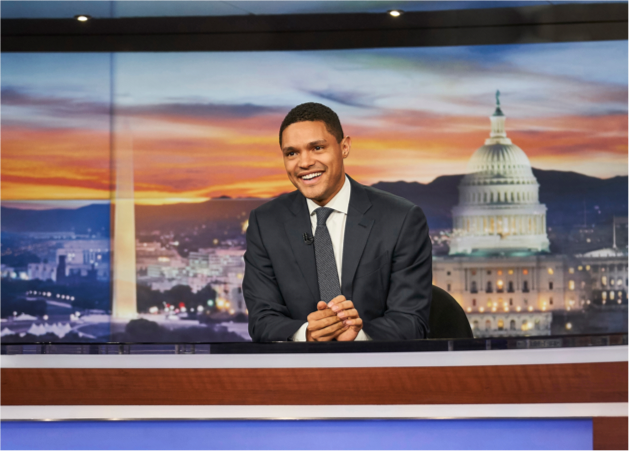 Hamilton borrowed from the imagery used to satirize the post-war obsession with American consumer goods. At the entrance to this exhibition, Colombian artist Miguel Ángel Rojas has spelled out the phrase in coca leaves, a wicked reference to consumer demands of today. The dirty beige and brown carpet that runs down a wall and along the floor may look like 1970s post-minimalism but is in fact the carpet of Carmen Argote's childhood home. The Mexican-born artist living in LA painted it white apart from the borders. It is both a document of transition and formal nod to the breakdown of painting and sculpture. It could be generic modern art except that every mark on the carpet is evidence of the life lived in a house by the artist and her family. Salomón Huerta's mesmerizing paintings of simple stucco houses with tidy landscaping, symmetrically styled and neon colored, are awarded an aesthetic allure more typically reserved for grander dwellings. The architectural fundament of LA, they resonate in their humble beauty. 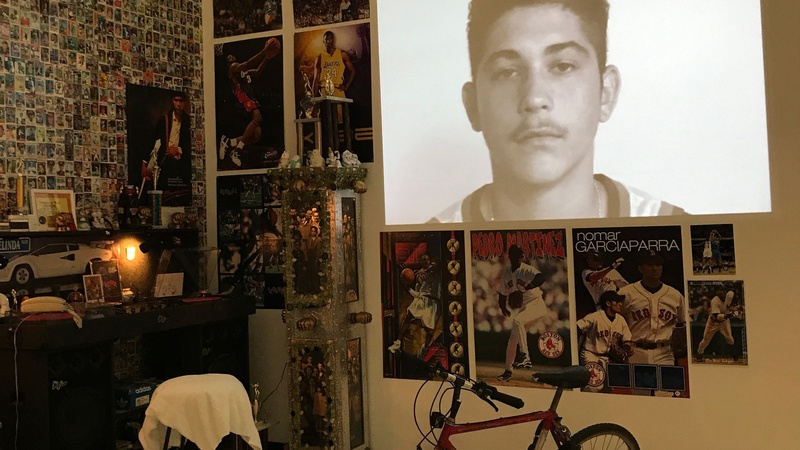 An adolescent boy's bedroom, obsessively decorated with posters of athletes, a desk and bicycle and mirrored floor contrasts dramatically with the adjacent view of prisoner's cell. These are the reimagined living quarters of a son and his father with video projections playing their actual conversation with one another. This installation by Pepón Osorio, born in Puerto Rico and living in Philadelphia, sears with its poignancy and pain. 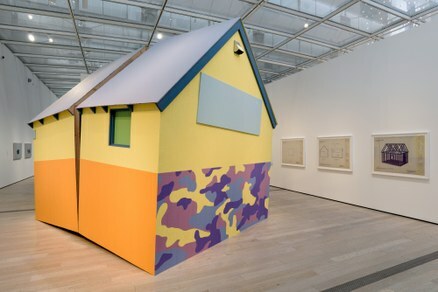 LA native Daniel Martinez recreated the cabin used by Unabomber Ted Kaczynski but it is sliced in two halves with the exterior painted in cheery colors selected from Martha Stewart's catalog and referencing "domestic" terrorism by the American born killer. In 2009, Camilo Ontiveros made a bundled mess of a sculpture out of his own mattress, bicycle, clothes and other items. To recreate this piece for the show, he used the belongings of one Juan Manuel Montes. To gain the import of that gesture, you have to read the wall label detailing that these possessions were left behind after Montes deportation, despite being given protected status under Obama's Deferred Action for Childhood Arrivals. (DACA) As the label says, the precariousness of the stacked items symbolizes the situations of immigrants under the current US administration. Home, as an exhibition, is intellectually enticing without losing its heart. Whether artists are well known and or just getting started, the show proves the profoundly emotional impact of artists working under less than ideal circumstances throughout the Americas. The exhibition is on view to October 15.